The European Superstock 1000 Championship riders are back in action after a long and deserved summer break, and with just two races left on the calendar anything could still happen. Three riders remain in the title race, but several more have shown the pace to play much more than just a bit-part role at the Autodromo Internacional do Algarve. Markus Reiterberger (alpha Racing-Van Zon-BMW) holds a 14-point lead at the top of the championship standings. The German rider has won four races out of six this season, three from lights to flag, and taking pole in each one of them; the 24-year-old has been ruthless when in the lead. The remaining races are anything but a formality for Reiterberger however: just one mistake or technical problem at Portimao could throw him off the top of the standings and place him in a very perilous position going into the final round. The former WorldSBK rider will undoubtedly try to get the job done early. His main rival going into the season-end is Maximilian Scheib (Aprilia Racing Team), who has shown incredible consistency all throughout the year. The Chilean has scored five consecutive podiums along with a fourth-place finish at MotorLand Aragon (he suffered a mechanical failure two laps from the end, while riding in second), and will be ready to pile the pressure on his championship rival. The other rider left in the championship battle is Roberto Tamburini (Berclaz Racing Team), 28 points from the lead. The Italian knows what it’s like to win at Portimao, taking victory in 2015, also on a BMW. While he faces an uphill battle, another win in Algarve would automatically keep his title options alive going into France – and in an all-or-nothing race, anything can happen. Federico Sandi (MOTOCORSA Racing) will travel to Portugal searching for a first return to the rostrum since the opening race of 2018. While the Ducati rider cannot catch Reiterberger in the standings, he will be looking to prove a point and come out on top at Portimao, the same track where he took his best WorldSBK result back in 2013. While Florian Marino (URBIS Yamaha Motoxracing STK Team) will not be in the title hunt during the final rounds as he was in 2017, the Frenchman has shown good pace at Portimao in the past, finishing last year’s race in second. A return to the rostrum could be the spark Marino needs before facing his home race at Magny-Cours. 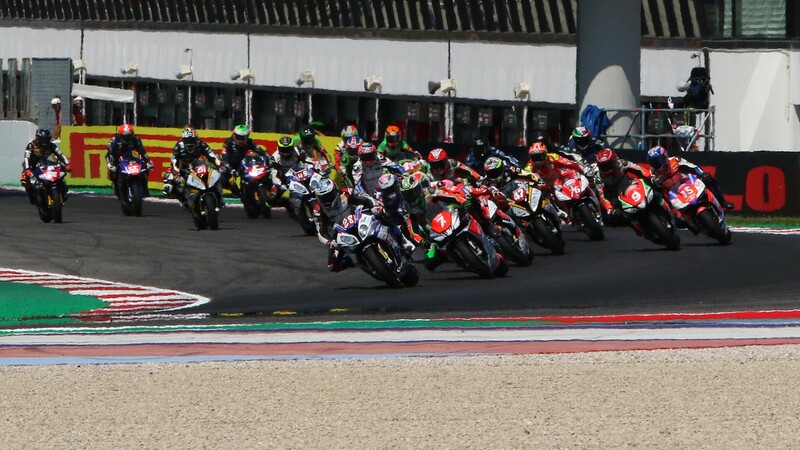 Catch the penultimate race of the European Superstock 1000 Championship season and all of the best reactions thanks to WorldSBK VideoPass.